Mike Agnew diving Glover's Reef. How much? $1795 - this does not include round trip air from the States. 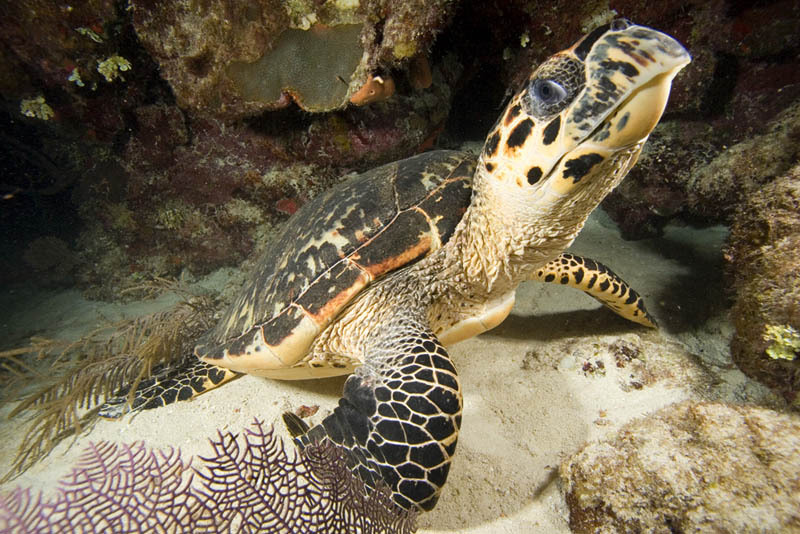 It includes round trip air from Belize City to Dangriga (by puddle jumper), the 30 mile transfer to Glover's Reef (a true coral atoll in the Caribbean), all meals, accommodation, 3 dives a day plus night dive. 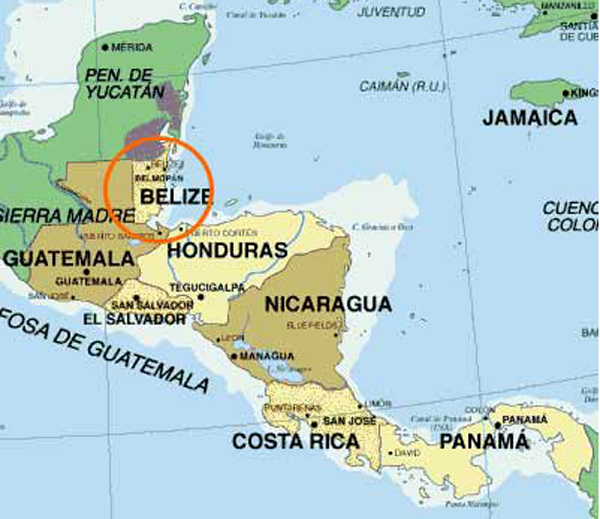 Getting there: Continental, Delta, United, American, TACA and U.S. Airways all fly to Belize. Current best price is around $750 round trip. Be sure to book yourself into Belize City (BZE) to arrive no later than 1PM, and to depart Belize City no earlier than 1 PM. Last time we visited (2006) most of us opted to travel the day before and overnight in Belize City. This allows any missing bags to be located and delivered in time (no one had a problem but it is good "insurance"). This accommodation is not included in the trip price. 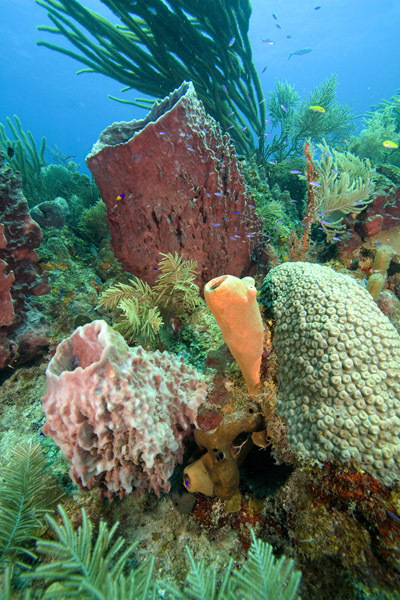 Glover's Reef is in a Marine Protected Area (MPA) and has some of the most pristine reefs in the Caribbean. Dave Herrick and giant barrel sponge, Dave is the object on the left. 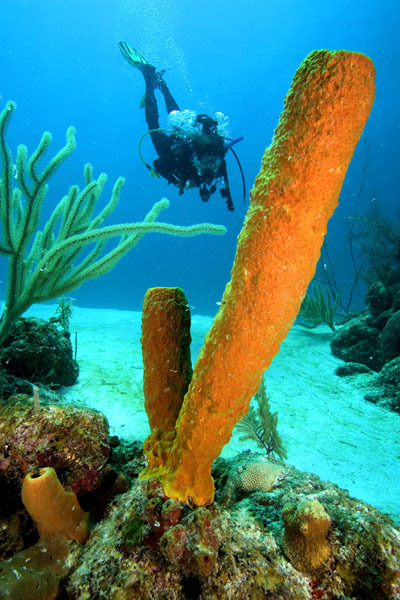 Diving at Glover's Reef is said to be like how the diving used to be in "the old days". The resort, Isla Marisol, is on an island long owned by the Usher family. 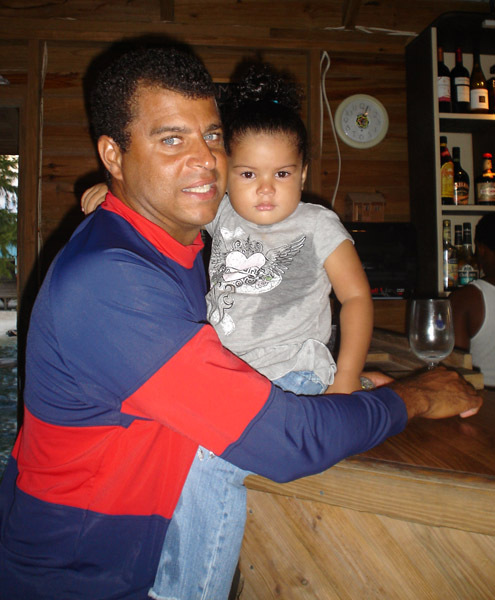 Eddie and daughter Elissa in 2006. Our host, Eddie, is a great diver, knows the place intimately and is always willing to help. As a family owned business the money we spend goes directly into the local commnunity and isn't sent back to some absentee owners stateside. 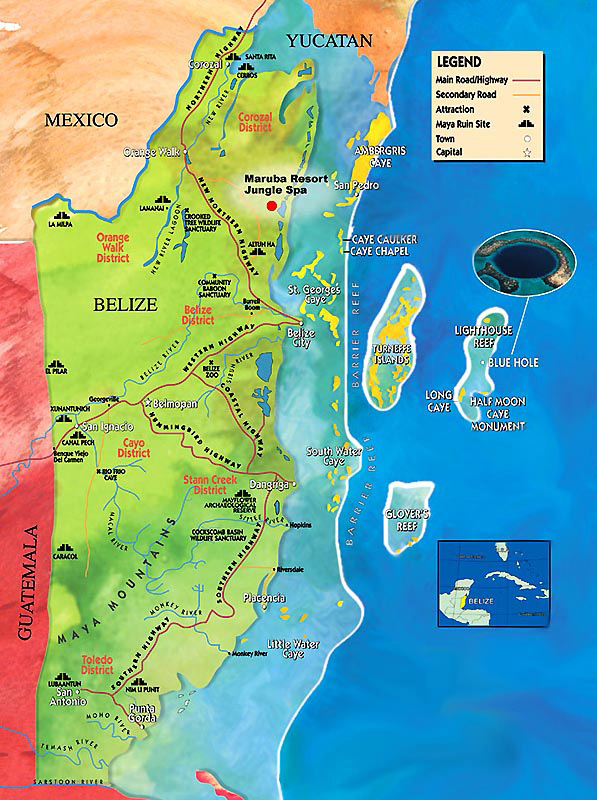 The official language of Belize is English - the place used to be called British Honduras prior to independence - here's the official Belize website, and here's the Wikipedia entry which is probably more useful. You guys might think I'm a little biased so here's a review written in 2009 by Craig Grube an Undercurrent contributor (Undercurrent is the "secret shopper" of the dive world). Isla Marisol is about an hour boat ride from Dangriga Airport; take Dramamine if you are prone to motion sickness. Depending upon which boat they use and the sea conditions, you may get wet. The covered boat is obviously the one you hope for. Glovers Atoll is pretty remote and the resort is almost a complete escape, so forget about cell phone or blackberry coverage. They do have wireless internet if you bring a laptop. No TVs to be had. You are there to dive, eat the excellent local cuisine, and hang out at the bar over the water, where Mora makes a mean cocktail, if you aren’t too tired from three dives a day. They do have kayaks if you want to explore the atoll. Depending on time of year you may end up with few divers, like we did. For the first 4 days there were 8. For our last 3 days, there were two of us to share this private island with the friendly staff and the numerous pelicans that seem to dive bomb the water all day long putting on a great show. The accommodations are rustic but more than adequate, as we had two full size beds, a ceiling fan, a few tables and open closet. The bathroom is simple, with limited hot water in the shower, and the toilet takes NO paper products but is a flush toilet. If you or your significant other requires elegant bathrooms, then take a pass. However, if you can live “civilization light” the diving and solitude are well worth it. Before I get to the diving, I must mention the food. Jenice and Alicia prepare regional dishes with fresh ingredients such as hand-made fish tacos, fresh snapper, lobster, a variety of potatoes we had never heard of but totally enjoyed, and steamed vegetables or slaws. We had excellent hot breakfasts of eggs prepared everyway you can think of and potatoes. The lunches were hot and varied. In 7 days I don’t think we had the same thing twice. Desserts were freshly baked puddings or cakes and excellent coconut or banana ice cream. I can’t say enough about how much we enjoyed the local cuisine, and the amazing variety of fresh fruit juices. The diving was excellent. Kitty was a great divemaster with amazing eyes for spotting small critters, eels, lobsters, octopus or whatever was around. If she is comfortable with your skills she gives latitude. Most of our 3-a-day dives were 45-55 minutes plus a safety stop. The boats were based on number of divers, and we rode in 3 different ones over the week. Captain Ishmael was friendly and helpful with camera gear, plus he plays a rockin’ bongo drum in the bar. Most boat rides were 5-10 minutes. Make sure you request trips to Long Caye Wall to dive, even though it’s a “long” 15-20 minute ride. 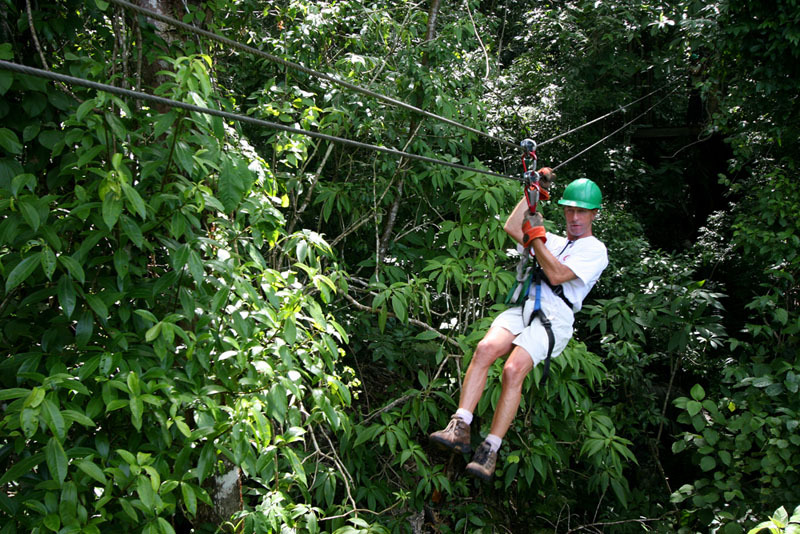 All safety stops are done back at the resort or on land at Long Caye. We were there the first week of March and the water was in the high 70’s, so bring a wetsuit as the water is a bit chilly. Land temps were in the low 80’s, but a little cool at night so bring a sweatshirt or jacket. Also bring Deet as the no-see-ums can take a toll if the wind dies down. 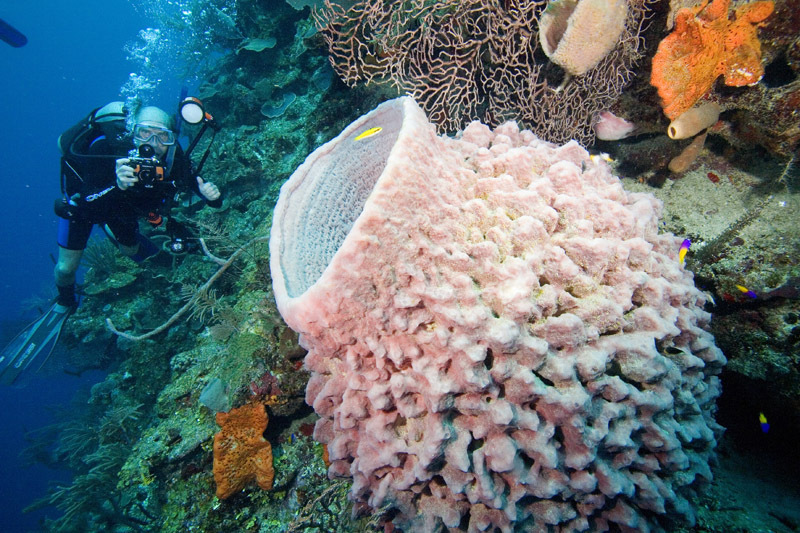 The reef was relatively healthy with lots of sponges, many huge and of odd shapes, and plenty of gorgonians and sea fans. In addition to the usual Caribbean tropical fish such as angels, trunk, cow, trumpet, etc., we saw several reef sharks on a couple of dives, eagle rays on several dives including swimming with a pair for 5 minutes on the top of the wall. The black grouper were very large and on every dive. We saw green sea turtles as well as one massive loggerhead. Lobsters seemed to be roaming quite a bit as well and scorpionfish were spotted on numerous dives. We typically saw fat green moray eels or smaller spotted eels. On the night dive we saw several slipper lobster, white spotted toadfish, and several octopi, including one roaming around the reef….most of the sightings on the night dive was thanks to DM Kitty and her hawklike vision. The owner, Eddie Usher, can be found diving, managing, or chilling and frequently joins for lunch or dinner and you can get a great history of the island from him. He is trying to get the island to all wind and solar power, and sources most food items locally in Belize. One suggestion would be to have the north side beach cleaned of trash once or twice a day as it detracts from an otherwise gorgeous island. My son and I had a great week of diving, hanging out and eating great food. Returning to Isla Marisol during whale shark season is high on our list of where to dive in the near future. This year I scheduled the trip a little too early for some of our "regulars" to come along - but even so there has already been substantial interest. You can check out who has committed to coming by clicking here. One of the reasons for the early date is that it will still be whale shark season and there may still be whale sharks hanging around Gladden Spit (where they go to eat cubera and other snapper eggs). Eddie offers whale shark trips at $175 a day. You can check out Isla Marisol here. I need to talk to Eddie about the schools of Pacific coral reef fish that appear on his rates page (pyramid butterflyfish, lined snapper and schooling bannerfish). This link takes you to a video discussing the Marine Reserve at Glovers. 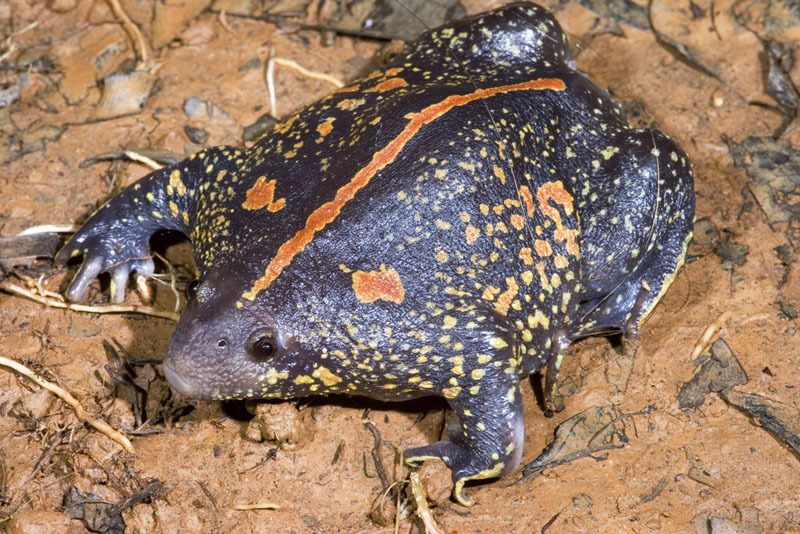 I will also be offering an "add-on" - a visit to the Belizean rainforest. We'll be staying at Ian Anderson's Caves Branch (no he isn't from Jethro Tull). Dave Herrick and I did the cave waterfall tour, the cave rafting and the zipline. Truly some of the most amazing experiences of my life (and I've had a few :-) ). A ball park figure for 3 nights, food and two adventures at Caves Branch is $650. 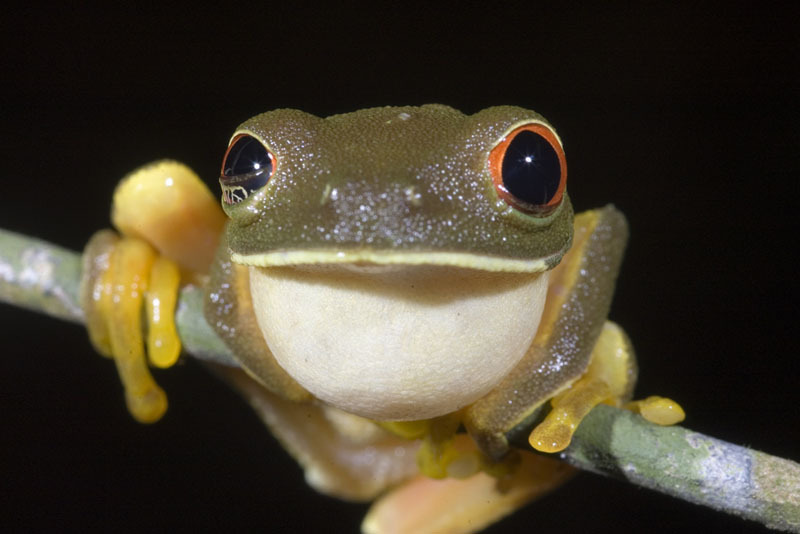 I have posted a few of the photographic gems from Belize on this page and there's some fun underwater stuff (mostly cartoons) here. There are already eleven people who have "signed up". I have yet to receive a deposit from any of them but as this is a "cheaper" trip I expect it to fill up reasonably quickly. I'd love to have you along and you will make new friends who will last a lifetime.